Lovely pic! The woodchip “background” is so different. From up top you can see just how dainty she is. Great photo love her shoes! 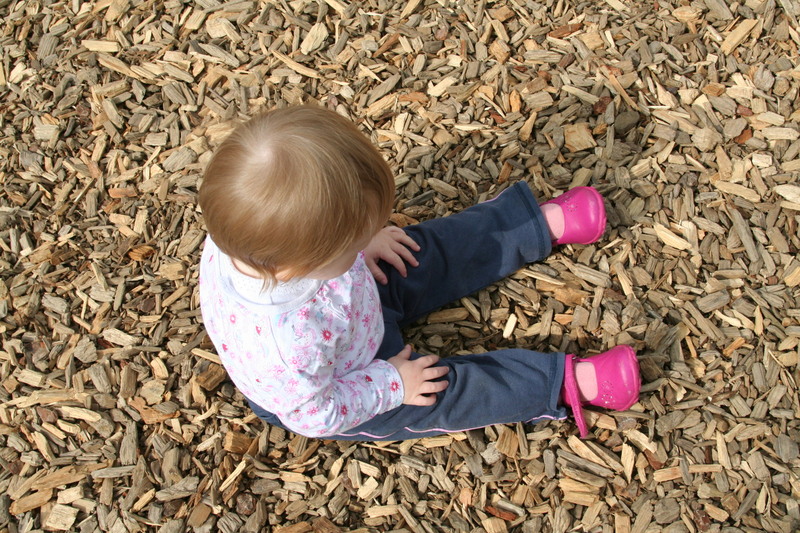 Great photo, is she pondering the shoes or the woodchips! I love the perspective, lovely photo. Awwww! My Little E has the very same shoes. Pondering if she should eat it? Awww tiny feet with tiny shoes! Be still my heart! “Wonder how many I can eat before Mum grabs me.” Brilliant shot. I’d be staring at my shoes if mine were that cool! Great picture. I love the angle! great colours in this shot, just lovely. Prepare a budget for a major shoe a holic! That is just so cute and I agree with Katie – love the perspective. I love how her pink shoes stand out so much against the brown of the wood. very cute shoes! You can see she is deep in thought without seeing her face, very cute pic! Great picture. She looks deep in thought about something…I wander what it might be? !